Appearance: Verve is a tiny thing, even for her age. She is stick thin, and not very muscular. This makes her legs look longer than usual, even more due to her big paws. Her heritage is as follows (note, this is only an approximate): ~50% coyote, ~25% wolf and 25% dog. Her pelt is long and messy, the mane and belly fur being the fluffiest zones, but still disheveled most of the time. Her fur is chocolate, the tone darker along her spine, tail, and legs (the legs having elbow reaching "socks"), with lighter spots that can be seen on the rumps and shoulders. The tips of the hairs grow lighter in her winter fur, giving her a lighter tone altogether during this season. She has heterochromia, right eye being bright orange, and the left one a chartreuse color. 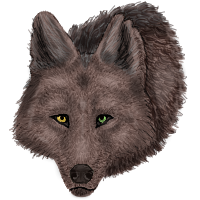 A few other unique traits are worth considering, apart from her body shape and eyes: Her muzzle is lean, rather coyote-like, so her teeth portrude a little, giving her an everlasting nervous appearance. She also has chipped ears and a few scratches, mostly covered by fur, due to encounters with other animals during her wandering. However, she has a bite mark in her left flew, due to a more serious encounter with a wild canine over food. It got infected, but is now in the process of healing properly. But as it is, it will never truly disappear. Both Optime and Secui forms mirror her lithe figure. Secui is a little bit more butch but overall taller, with long legs and canines portruding slightly. Optime shows little curves, barely any breasts, and her hair is mostly straight, the tips curving inwards a little bit but otherwise just having the aspect of a quite long mane. As a gregarious animal, she will seek the company of her kind. However, there are two traits that may hinder this task. One, distrust for strangers emerged from her experience. She was attacked several times by feral canines and other animals over food and territory. She is especially scared of bigger animals and secui forms. Optime is not as feared, and there are bigger chances that she approaches another canine if found in that form. Second, genetically she has developed behavioral broblems, leading to a hard time understanding and displaying acceptable social conduct. The fact that she seldom vocalizes may also present her as a challenge for well-adapted individuals. Her vocabulary is limited too, and often chooses not to talk, only if adressed repeatedly. Last, but not least, she is very adaptable, having inherited traits from both the coyote and wolf parts, and is the reason why she survived alone at a young age. After joining a pack, she has developed her social skills and now is able to communicate in an adequate manner with adults. However, she still displays a submissive and nervous behavior when in presence of strangers or people she does not know very well. NOTE: these traits may/will change with age, which will subject this field to future editing. Biography: Her family's lineage was not an important one, neither her parents' history. Just a couple of canine hybrids who happened to lack the Luperci traits and never pursued them. They mated, but the father had little to no interest in parenthood, and eventually left the female with a litter in her care. This new single mother gave birth to three pups, one a stillborn due to her being a first-time mother, and quite young as well. This also led to the demise of a second pup at the age of two months, leaving Verve alone. Despite her feral lifestyle, Verve's mother still had memmories of her mother and other canines she had encountered through her life. She knew of the Luperci, and of the location of a few of their packs. But still, she led her daughter through a simple life, hunting, sleeping, seeking shelter and fleeing danger. She taught her the basics, and both were mostly happy. Of course, both hybrids had behavioral hindrances, hence never actively searching a gregarious lifestyle, feeling more confortable with the presence of the other. But nature's laws prevail, and at six months of age, a bear claimed the mother's life, as she tried to protect the pup. She managed to escape almost unharmed, and thanks to her teachings, she was able to survive. Oh course, she was not exactly the example of an apex predator, and had her health lightly deteriorated, but could feed herself, find herself shelter, and keep herself out of trouble for a few weeks. It was around that time when her path led her to an area that reeked of canine activity. She was scared, of course, but if such big groups established there, it meant that there was enough food to support them. And food was a powerful enough drive to lead her to the packlands' surroundings. Relations: Charletter-Ebony: A quite nice relationship so far. She's a nice gal. Aeron: She had a deep respect for the woman, and owes her her actual life. Nyx: She's well acquainted with her and enjoys her company. She's the closest to a big sister figure. Mortifera and Malefica VedMaova: Mentors and, next to Aeron, the people that hold the most respect to her.